The 466th Bomb Group Association was started by WWII Veterans who had served in the US Army Air Corp at Attlebridge Field, located near the village of Weston-Longville in Norfolk, England. The B-24 Air Crews that came to Attlebridge and flew combat stayed there for4-8 months as they completed their 30 missions. Ground staff arrived in early March, 1944 stayed there until the end of the war. The mission of the 466th Bomb Group Association is to preserve the history and the stories of these brave young men and women who served. A total of 333 men of the 466th never came home. They paid the ultimate price. Originally the membership of the association was limited to 466th Veterans, but with the number of living veterans dwindling rapidly, children and grandchildren are taking on the role of continuing the work of the association. If you have an interest in joining in our efforts, drop us a line with information about yourself and why you would like to become involved. We publish a news letter that is printed 3 times a year and there are no dues required. We do encourage all to donate at least $10-20 annually to help pay for the newsletter. 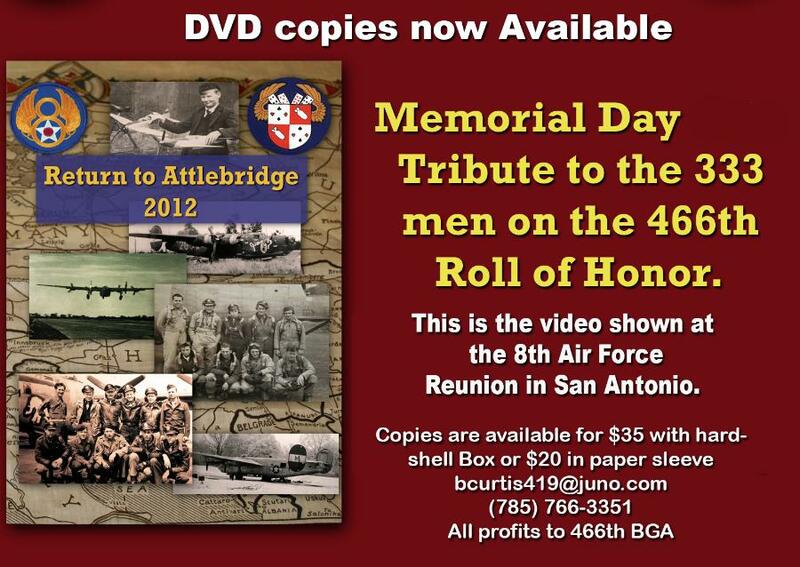 "RETURN TO ATTLEBRIDGE 2012 " is the video documentary, of our last trip with veterans in 2012 and can be purchased. This video features veteran interviews as well as interviews with the English locals who had fond memories of the American invasion of Weston-Longville in 1944. The video also features a memorial day tribute to the 333 bomb group air crews and ground personnel who died during the war- with a listing of the 466th Honor Roll. See information below.